The Detroit Institute of Arts(DIA) is one of my favorite places. I was an art major at Wayne State University and several of our projects involved going to the museum and studying the art there. 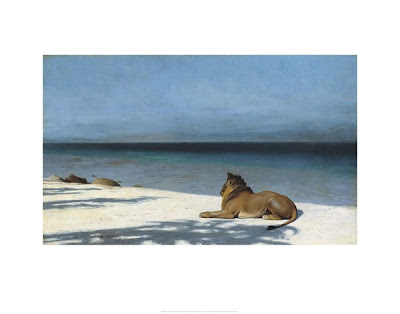 My favorite painting was by Jean Leon Gerome and it was called Solitude. It depicted a lonely lion laying in the middle of a deserted beach. The lion appeared to be at at peace. It’s tan main shone in the sunlight against the brilliant azure sky. Something about that painting, and that place spoke to me. The DIA echoed the atmosphere in that painting. It was a quiet museum. It was not crowded with throngs of people and during the day, when I visited, I felt like I was the only one there. I went there in between classes and wandered the lonely halls. The DIA like the rest of Detroit, was often abadoned. Entering the museum, the first thing you see is a room painted with massive murals by Diego Rivera. 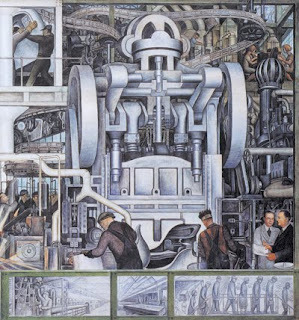 Rivera did these paintings when the museum was founded in 1927. The museum was built as cultural center for the then beautiful city and the art within the museum reflects the time and effort that was put into the collections. The Rivera paintings alone are worth a visit. However, like many places in Detroit, the DIA is haunted. Security gaurds who have worked at the DIA at night report seeing all kinds of strange activity in this museum at night. Loud thuds echo throught the halls of the empty museum and there are sounds that seem like people are dragging the paintings from room to room. When the noises are investigated, all the paintings are where they are supposed to be and the rooms are empty. 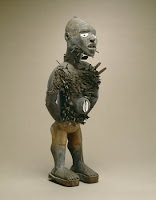 Much of the haunting activity seems to surround a statue in the African art gallary called the Nail Figure. It is the statue of a man impaled with spikes and many gaurds report seeing this statue moving or even dancing alone in the dark.